If you teach in a school that’s had the same principal for the past five years, you needn’t read any further. With so much focus on the national teacher shortage and high teacher turnover rates, it’s easy to overlook that principals are moving in and out of schools at an alarming rate as well. According to School Leaders Network (SLN), 50 percent of principals are not retained beyond their third year, with principals in high poverty districts doubly as likely to leave within six years. When a teacher leaves a school, the teaching team is affected deeply-- from class coverage to changed roles, to the frustration of waiting for the school or district to find and train a new teacher. Once chosen, the team will need to transition their new colleague into the existing culture and planning, which takes time and energy. When a principal leaves, the impact on the school and community can be even more profound. Everyone feels it: student achievement falls (according to SLN), faculty morale nosedives (it takes an average of five years to build a solid staff culture, SLN says), and school-wide and district-wide policies and programs get put on a back burner. A principal leaves, and an entire school staff is left waiting anxiously to see what their future looks like. Enter the school’s new principal; His or her leadership style is about to profoundly impact the success (or failure) of the entire school. As teachers, we can’t control how a new principal chooses to enter our school, but we can manage how we respond. When we proactively welcome a new principal, while continuing to moving the work of the school and community forward, the transition eases, and the entire school benefits. 1. Introduce Yourself. Every one of you. While this may seem simple or obvious, a staff of teachers who introduce themselves to the new principal sends a much different message than a group who sits in their classrooms and waits. When introducing yourself, use this opportunity to ask about the new principal’s background, leadership style, and what matters most to them in a school community. While it can be expected that a select group of Teacher Leaders at any site will introduce themselves, when an entire staff does this, it sends a clear message to the new principal: we are a united group of teachers who cares deeply about the culture of this school—and we’re happy you are here. This small act can make a huge impact. 2. Advocate. I have had the great opportunity to travel the country and collaborate with Teacher Leaders on how to effectively lead and coach at their school sites. I can’t tell you the number of times a Teacher Leader has told me about the amazing program that they have spent countless hours building, only to have the new principal come in and dismantle it. While it often feels out of our hands, we can have more power in these situations than we may realize—again, if we’re proactive. Just as a new teacher forms their impressions about students and teaching based on their first few years in the classroom, a principal is forming their initial impressions of the school based on what they see and hear in their first few months. So, I repeat, don’t sit back and wait for the principal to figure out what you’re working on. Use this critical time to tell her about the important work you’ve done, the success you’ve had, and your vision for the future of this important work. You don’t want your work to end up as just another line item in a principal’s budget. Advocate proactively for your work, so the principal has a name, a face, and a few conversations under their belt when they are deciding which programs to support. 3. Empathize. Remember how nervous you were prior to starting your first day as a teacher? While not every principal who is new to your school is a new principal, I’ve rarely met a principal who didn’t want to be a well-respected, effective leader (and yes, raise test scores—as their jobs often depend on it, to no fault of their own). Most principals begin as teachers, having developed an expertise in curriculum and instruction. Leadership is not a course most of us took in our credential, or even master’s, programs. For most principals, leadership is something they learn along the way. Keep in mind that the leader they are today is not necessarily the leader they are becoming and understand that, like every great teacher, they will struggle and not always handle every decision with perfect execution and grace. Help them thrive by showing them compassion, and being a progressive leader yourself. Presuming positive intent is something that we’ve hopefully learned as teachers to do with our students and peers, and it goes a long way with supporting our leaders as well. Here’s hoping your school year is a great one—where students grow, and teachers and principals thrive. 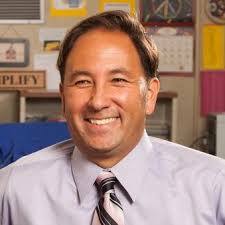 Alex Kajitani is the 2009 California Teacher of the Year, a member of the National Network of State Teachers of the Year (NNSTOY), and the author of the acclaimed book, Owning It, which was named “Recommended Reading” by the U.S. Department of Education. Visit www.AlexKajitani.com for more.